The guts of the ROM's new powder diffractometer, a tool for the studying the crystal structure of minerals. 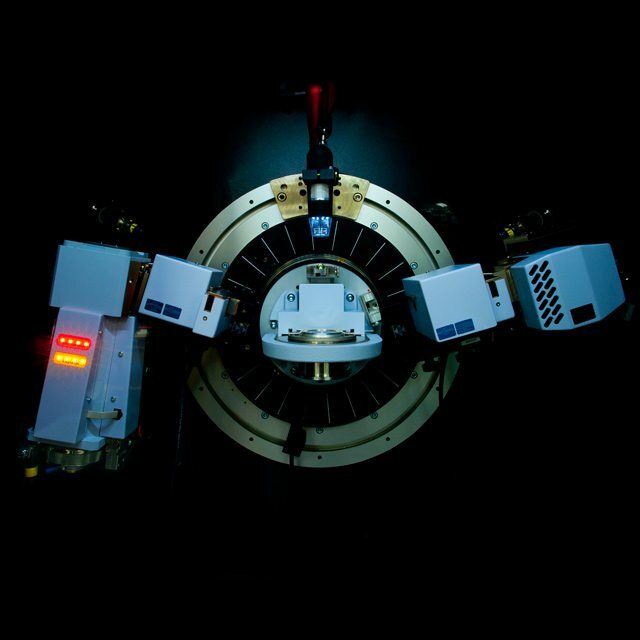 The guts of the ROM’s new powder diffractometer, a tool for the studying the crystal structure of minerals. One of the ROM's three DNA labs. One of the ROM’s three DNA labs. 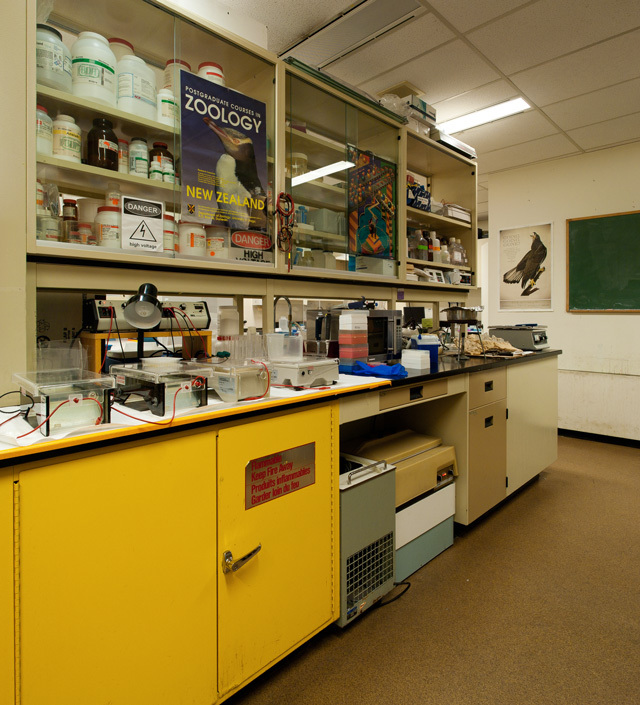 A view of a mineralogy lab. An optical goniometer. This vintage piece of equipment is still used by the ROM's mineralogy technicians. An optical goniometer. This vintage piece of equipment is still used by the ROM’s mineralogy technicians. Another view of the same DNA lab. A basement mineralogy lab. The grey box on the left is the ROM's new powder diffractometer. On the right is the (equally new) single-crystal diffractometer. A basement mineralogy lab. The grey box on the left is the ROM’s new powder diffractometer. On the right is the (equally new) single-crystal diffractometer. Some clutter in one of the museum's mineral-cutting rooms. Some clutter in one of the museum’s mineral-cutting rooms. Just a scanning electron microscope. No big deal. A large meteorite gets sliced into sections by a diamond wire saw. Since the meteorite is composed largely of metal, the cutting process is very gradual. These are meteorite slices, made with the diamond wire saw. Thermal cyclers. They look like rice cookers, but what they actually do is replicate DNA. This is the x-ray machine the mineralogy lab was using before all the snazzy new equipment arrived. A closeup of the inner workings of the single-crystal diffractometer. The sample rests on the tip of a tiny thread of glass, visible as a blue streak in the centre of the photo. When most of us think of the ROM, we think of the Michael Lee-Chin Crystal, which is the museum’s instantly recognizable (if controversial) public face and main entrance. But go around to the opposite side of the building, just north of the mothballed and probably-soon-to-be-demolished McLaughlin Planetarium, and you’ll find a second, less inspiring, more businesslike addition to the ROM’s original early-twentieth-century structure: a beige block-like collections and research building with nine floors (three below ground), dating from the early eighties, where nowadays Mark Engstrom listens to mice sing. “The deer mice we have in our backyards I’ve worked on for 30 years, and I would have sworn they were silent,” Engstrom, deputy director of collections and research, tells us inside a DNA research laboratory hidden just behind and above the ROM’s central atrium. He stumbled onto the singing of the mice (it could also be described as squeaking or chattering, but “singing” is Engstrom’s word) while researching their vocalization genes with a student. It seemed at first that most of the mice were mute. “So we started recording them in ultrasonic range,” says Engstrom, “and they’re making these beautiful calls, that you’re just not hearing.” Most emit one or a few notes at a time, but there’s a lab mouse named Pavarotti that can do more than 60 before he starts to teeter with exhaustion. The theory goes that there’s something in Pavarotti’s genes that makes him different from mice that sing less, or don’t sing at all. The ROM’s genetic research is not devoted exclusively to plumbing the mysteries of ultrasonic mouse opera. (A field, by the way, in which Engstrom tells us the museum is leading the world.) Oliver Haddrath, a staff ornithology technician, uses the DNA lab—one of three in the collections building—to investigate evolutionary relationships between species of birds. He shows us some thermal cyclers, machines with the size and appearance of rice cookers that can take a tiny amount of DNA and replicate it enough times that it can be studied. And then there’s the Hitachi gene sequencer, a tabletop unit that turns the mysteries of life into somewhat-less-mysterious computer displays. With all this equipment and 45 research staff, including Engstrom and Haddrath, the ROM is influential in international research to a degree that might surprise some visitors. Like for instance, there was that time they helped nearly double the number of species of kiwi known to humanity. “When we started this project in 1994 there were three species of kiwis: The Great Spot, the Little Spot, and the Brown,” says Haddrath, referring not to the fuzzy green fruit but to the squat, long-beaked flightless birds that live mainly in New Zealand, in rapidly decreasing numbers. After some tinkering, Haddrath and some other ROM scientists, in collaboration with scientists in New Zealand, discovered that the Brown kiwi was actually three distinct species of brownish kiwis that all looked pretty much the same to humans. Now there are five generally recognized species of kiwi. On the back of Haddrath’s white lab coat—he never removes it during our 90-minute interview—is a heat-transferred illustration of what looks like the skeleton of an ostrich, but only to non-ornithological eyes. “It’s an elephant bird,” he tells us. “The one that got away.” The giant, long-necked species (here is a picture of one next to some dinosaurs) lived in Madagascar before they died out, at least 300 years ago. Haddrath says they’re a missing link in large bird history, but for him they’re also a continual source of chagrin. The few remaining elephant bird eggs are too costly for the ROM to buy, and despite a couple of opportunities to experiment with samples from the British Museum, Haddrath has never been able to isolate any DNA. His lab coat reminds him that there’s still work to do. Most of the collections and research building is used for collections storage. Staff estimate that there are six million items on shelves, away from prying eyes, all of which have research value of one kind or another. We don’t visit those areas. Instead, we walk down a university-esque hallway that connects some of the DNA and paleontology labs to an elevator, which we take down to one of the three subterranean floors, where Malcolm Back helps run the mineralogy labs. Back takes us down a hallway past a pile of debris—mineral specimens, cardboard boxes with a stuffed animal sitting incongruously on top—into a windowless back room where a machine is using a piece of diamond-coated wire to cut thin slices off a meteorite the size of a turkey—as though it were, in fact, a turkey. It’s a slow process, because meteorites, unlike turkeys, are made largely of metal. In another windowless room, Back shows off two expensive new additions to the ROM that the public will rarely, if ever, get to see: a powder diffractometer and a single-crystal diffractometer. Both machines are grey boxes with transparent panels that give onto complex arrays of hypertrophied looking, vaguely camera-ish equipment. They use x-rays to see inside the atomic structures of crystals. This lets technicians identify mystery minerals with a very high degree of certainty. Each machine costs about a quarter million dollars to buy. Most of the money came from a private donor. Back pulls a piece of film with some concentric circles on it out of a drawer and explains how he did things before the new machines arrived about a month and a half ago. “We would take our sample with small film like this, he says. “We would run it on the x-ray equipment, what they call a camera, for about three or four hours, develop the film, scan the film in, and then match it against databases. Which would take six, seven hours, probably.” The old x-ray machine, a knobby relic from the ’60s or ’70s, still occupies a spot by one of the lab’s walls. “Now we can do the same work usually within half an hour.” Back is already identifying samples he’d given up on years ago. He and his colleagues even identify new minerals, on occasion. Such is life in the ROM’s business end. The surroundings weren’t designed by a celebrity architect, the hallways are a little cramped, and there’s no gift shop at the end. But the science, at least, is for real.